First of all, I'm no poet. I'm just the type of person that prefers reading my kids books that rhyme. They are just more fun! So anyway, this past week while I've been giddy thinking about finally having a daughter, I thought up bits and pieces of a poem for her. It's nothing amazing, but fun to write and something to remember my thoughts from this week. Oh sweetie, I jumped for joy! I wanted to have a little girl. And contouring? Just forget it! My love for you will never end. And two Grandmas who don't live far! But you may like them even more. And I'll let you play dress-up all day! But there's not a note I don't know! We can rock a messy bun. But I know some recipes we can make! I know I can get you laughing! On all of your new clothes. When you see that life's not fair. And to walk by faith, not sight. And to have a great, big heart! And loves you more than anything. For you, to be a great Mom. Just for fun, I'll give you a nice little breakdown of the past hour at the Hill house. 9:50am- Hubby leaves the house, kids sense that they have me very outnumbered. 10:00am- I shut the TV off and tell the kids to go play! We have so many toys and fun stuff to do! 10:05am- I go into the bathroom to clean it, closing the door behind me so that no little people come in and try to play in the toilet. 10:15am- I come out feeling so accomplished! The bathroom looks great, we're off to a good start for the day! 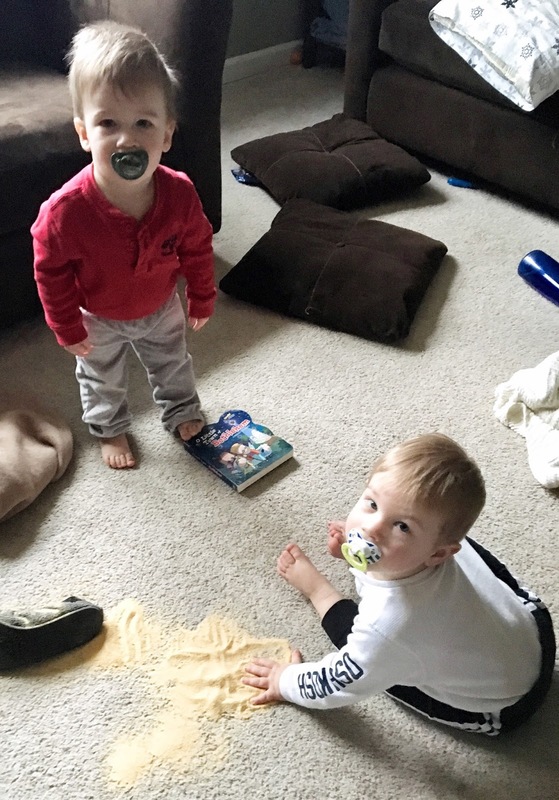 10:16am- I walk into the living room to find the twins playing in a pile of garlic powder on my carpet. Yes, an entire bottle of garlic powder. 10:17am- I assess the situation, take a picture, yell, reprimand them, discover the layer of garlic powder on Easton's scalp, channel my inner Ross Geller and ask WHY DO BAD THINGS HAPPEN TO GOOD PEOPLE?! ?, get the vacuum out, start vacuuming. 10:20am- Bring all three into the bathroom and put Easton in the shower and scrub his head. 10:21am- Watch Maverick and Tucker destroy the bathroom I just cleaned... let's do it all again! 10:30am- Sit down to computer to type this all out. 10:35am- Hear Mavy dump a bag of Veggie Straws on the kitchen floor, decide to just roll with it. 10:40am- Slow computer crashes, blue screen and all. I decide to give up on today. I try and calculate how much caffeine I've had today and how much more I can have before it makes me a bad pregnant mom. 10:50am- Make plans for the rest of the morning: find chocolate, put kids down for nap time early, light a candle to help my house not smell like we're trying to ward off vampires, finish the bag of Cheetos I started yesterday, turn on Netflix and neglect my responsibilities. We'll try again tomorrow. We had the ultrasound and the party yesterday and it was one of the most wonderful days of my pregnancy! We loved telling families we were pregnant, and we loved putting our announcement pictures up, but there's just something about finding out the gender! It feels real now! We did a photo booth at the gender reveal party and made all the family guess before hand. I'm so glad we did that; I will treasure those pictures! Me and the hubby before we found out. After three boys, almost all of us were "team girl!" And as you can tell by the screams in the video, we were all thrilled to have been right!!! I was just over the moon last night and I dreamed of pink confetti all night. I can't believe I get to have a daughter! We are so blessed! I don't know how many times I said to myself, I need to update the blog! It's been like 6 months, and a lot has happened between then and now. The twins are now 17 months old, and giving me a run for my money! They are sweet, cute, cuddly, and wonderful but also full of trouble. They definitely keep me busy in a much different way than they did a year ago. Their personalities are awesome and completely different from each other. It's an adventure every day with them! 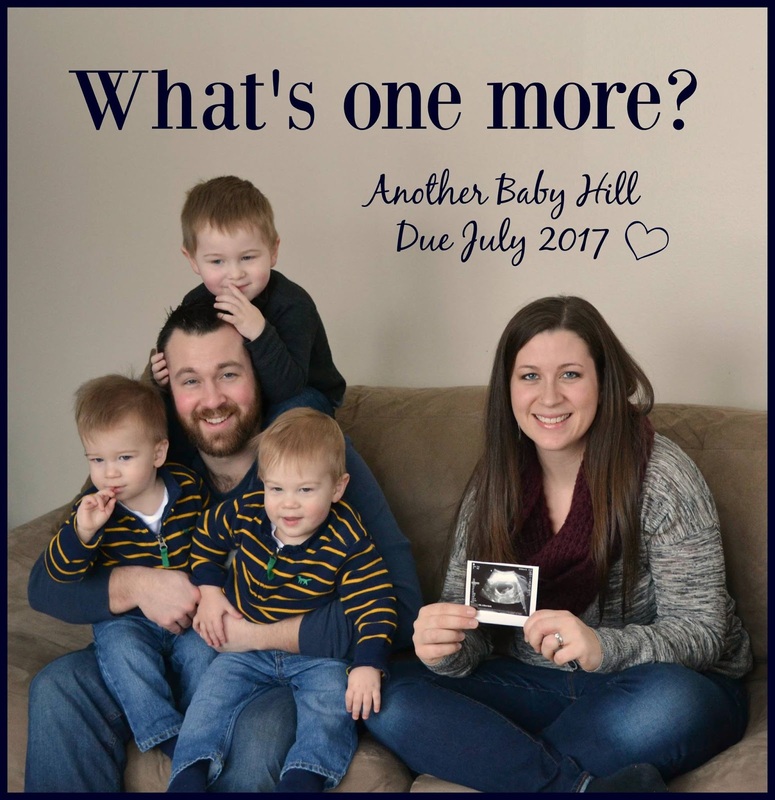 The latest development in the Hill family is the 4th (and final?) little Hill on the way! I will be 14 weeks tomorrow with our little bundle of joy and we will find out on Saturday what that bundle is! (I'm team pink! I need backup in this house full of men) This baby was definitely a surprise. We planned for a fourth but were still trying to figure out timing; we were hoping to have the twins potty trained before the 4th arrived. Buuuuttt, surprise! God has a better plan every time. We are very excited! We were a little nervous going into the first appointment, worrying that my ovaries had been overachievers again. To our relief, the doc pointed out one sweet little baby. We weren't sure we could survive another set of twins...especially only 2 years apart. Knowing that this most likely would be our last, I really wanted to be able to enjoy this pregnancy a little more than the last. I'm quite confident after carrying twins, one will seem a bit easier. I have always enjoyed pregnancy anyway, especially since I never dealt with many issues. I was nauseous for about a month with this pregnancy but like it's supposed to, it has subsided as I enter my second trimester. I'm still a bit tired, but I blame that on the fact that coffee repulses me right now. I'm hoping that changes soon.